If you are considering becoming a cosmetologist, it's natural to be curious about what kinds of classes and courses you will be taking as part of your curriculum. Students enrolled in this type of program learn from classroom lectures, demonstrations, and supervised hands-on training, first with mannequins, and then with actual clients. This mix of instruction type allows students to effectively prepare for real-world cosmetology careers. The exact amount of course hours required differs by state, so be sure to thoroughly research your area's rules and regulations before settling on a cosmetology program. There are different cosmetology career pathways available, and depending on what type of cosmetology program you enroll in (esthetician, barber, etc. ), your courses and required practice hours may vary. A true cosmetology program will incorporate lessons in hair, nails, skin, and makeup, along with necessary information pertaining to the business side of the profession and health/safety regulations. Hairstyling - techniques in this course include pin curling, roller setting, hair wrapping, blow-dry styling techniques, and more. Chemical Restructuring - this course highlights the various ways a stylist can change the texture of a client's hair. Hair Coloring/Lightening - students learn about the effects of porosity and melanin on hair, and how to perform color services such as highlighting, covering gray, lightening/darkening hair, and more. Hair Cutting/Shaping - techniques on how to identify the best haircut for the client's head, handling various hair densities and textures, and how to utilize multiple haircutting tools. Skin Care & Procedures - includes information and techniques for facial services, make-up artistry, and hair removal. Shampoo, Rinses, Conditioners & Treatments - this course teaches students how to identify hair and scalp conditions and their solutions, and how to utilize different shampoos and conditioners to address specific haircare needs. Safety & Health - this important course outlines the principles of infection and prevention, as well as procedures and practices for proper health and safety of both the stylist and client. Professional Requirements - the "behind-the-scenes" aspects of cosmetology, including budgeting, time-management skills, effective communication, ethics, and more. Anatomy & Physiology - an overview of the human body as it relates to the health and appearance of the skin, hair, and nails. Hair & Scalp Disorders & Diseases - outlines abnormal hair growth, dandruff, brittle hair, and other diseases and disorders that can plague the scalp and affect hair. Chemistry as Applied to Cosmetology - this course provides an outline in chemistry to help students understand and safely handle the chemicals involved in hair treatments. 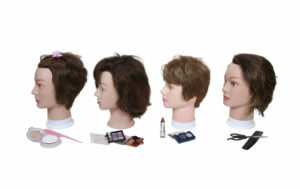 Once students have completed the classroom portion of the program, they typically move on to the hands-on portion, where instructors guide and monitor them through treatments, cuts, and techniques on both mannequins and human volunteers/clients. To accommodate busy students who may have family or other work obligations, most cosmetology schools offer both part-time and full-time attendance options. Courses may be offered in the daytime or the evening, and some weekend courses may be offered or required, depending on the attendance option the student has chosen. Tuition is typically the same amount for both full-time and part-time options, but full-time attendance will allow the student to complete the program in a shorter amount of time, roughly 30-36 weeks for most programs as opposed to the 50-54 weeks it may take for part-time students. Most schools are closed on national holidays. Ready to start your career as a cosmetologist? If the above classes and training are intriguing find cosmetology schools and course schedules in your state, instantly. From community colleges to beauty academies and institutions, the right cosmetology program is never far away. Start browsing now, and you'll be on your way to a satisfying career in the beauty industry in no time!